This is a summary of a talk I attended at the NSCA Trainer's Conference in Las Vegas. It's a topic I feel that many people can take back to their own programs to get the most out of them. The key to training for strength and hypertrophy gains lies in maximal recruitment of motor units. What does that mean? First, a tutorial on motor units. 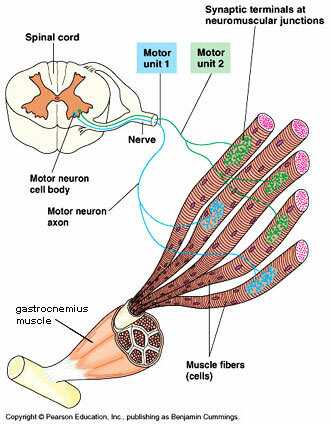 A motor unit is the bundle of muscle cells that are controlled by the same neuron. Muscles that need more dexterity, such as those of the forearms that control the fingers, have a higher nerve to muscle cell ratio, whereas muscle that have fewer varied functions, such as the hamstring, have a lower nerve to muscle cell ratio (fewer nerves to muscle cells). Common "knowledge" in gym circles is that as your muscles tire out, you start to recruit more motor units to finish the job. This is the reason behind drop sets. I'm sure you've seen, or been, that guy with the 5 lbs dumbbells looking like he's going to pass out doing bicep curls. Just a few more to hit those last muscles. Not so fast. What you're actually experiencing is the fatigue, and subsequent drop out, of motor units doing the movement. Maximal motor unit recruitment can only last about 10 seconds. Why is that? More anatomy time! Each muscle is made up of three types of fibers. Type I is considered slow twitch, they last the longest to fatigue but produce little force. Then there are type IIa (fast twitch, slightly more metabolic capacity) and type II b/x (fast twitch, most powerful, beautifully anaerobic). When you flex or lift a weight, the first muscles activated are the low power, long lasting type I fibers. As the weight gets heavier, or as the athlete moves faster, type II fibers get recruited. Max effort attempts at speed or load will tap into the type IIb/x, along with all the "slower" muscle types. Three types of energy systems. So how do you best train for maximum motor unit recruitment? I've already mentioned two: as heavy as you can go, or as fast as you can move for up to 10 seconds. Though I'm sure you've all seen the muscle and strength on a gymnast: there is a third way. Time under tension in an isometric. 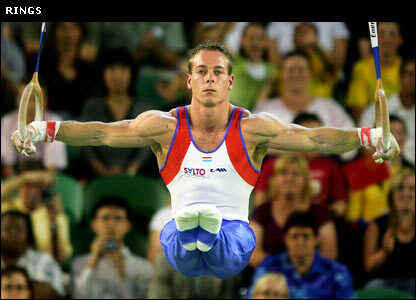 One reason that those male gymnasts have such incredible biceps and shoulders are the max tension holds they put on their levers in positions such as the iron cross and front and back levers from the rings. Isometric bicep contraction during the iron cross, in order to protect the elbow, is the best example most of us can imagine.